On New Girl Season 5 Episode 2, Jess decides she is ready to get back into the dating scene after seeing how happy Cece and Scmidt are together. Jess decides to go out with a man named Fred, but is instantly turned off when it turns out to be extremely dull. Unfortunately, his parents are amazing and Jess is determined to stick it out so she can continue to have a relationship with his parents. Jess eventually realizes she can't stay in a relationship because of the parents and breaks things off with Fred. Meanwhile, Nick and Schmidt finally become part owners of the bar and are the new managers. Schmidt wants to turn Nick into a manager who rules with an iron fist, but Nick wants to stay friends with the staff. 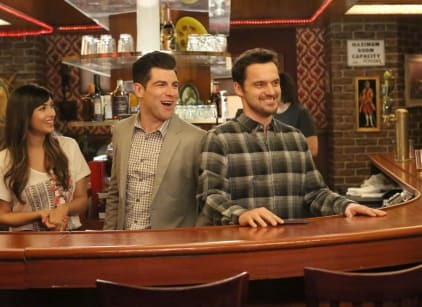 Schmidt convinces Nick to be tougher, but things backfire when the entire staff quits after Nick fires one of the bartenders. Cece tells the guys if they re-hire the bartender the staff with come back. Nick and Schmidt are able to convince him to come back and Schmidt realizes Nick would be a good manager, but he just has to work on some things first before taking over completely. Don't feel bad if you missed out! You can watch New Girl online via TV Fanatic anytime.